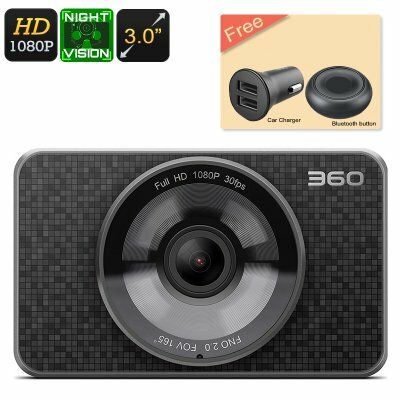 Successfully Added Dash Cam 360 - Full HD 1080P, 60FPS, 3 Inch Display, 1/2.7 Inch CMOS Sensor, Night Vision, G-Sensor, Loop Rrecord to your Shopping Cart. A 165-degree wide angle lens manes that nothing in ahead of you can go unnoticed. The 360 dash cam not only looks great but offers fantastic specs. With its auto on and off functions, the 360 dash cam will begin recording whenever you start a journey so you'll never need to worry about pressing record. Thanks to the powerful Ambarella chipset and a 1/2.7 inch CMOS sensor you'll be guaranteed great quality video every time. This dash camera also features a 165-degree wide angle lens ensuring you capture a stellar image of the full road in front. As this dash cam records video in full HD resolutions at 60fps you'll have clear footage that you can rely on in event of an accident. The recordings go directly to a micro SD card (not included) allowing it to store up to 128GB of video and images. These can be reviewed on the 3.0-inch screen so you can play them back directly on the camera at the roadside should the need arise, or alternatively transfer them to a computer for safe keeping. The advanced H.264 compression technology allows you to store more footage while the loop-cycle recording will overwrite unneeded videos allowing the dash cam to makes efficient use of the storage space. This dash camera has a G-sensor function that will detect heavy braking or sudden changes in the direction such as in collision avoidance. This will trigger the current video to be locked preventing it from being recorded over. You can also manually enable the video lock function at the touch of a button if you want to save video footage of other events such as road rage or being cut up by a reckless driver. With the WDR technology and night vision support, you will be able to capture high definition footage in low light conditions and at night. The anti-shake feature will stabilize the footage and a parking monitor will even detect collisions should someone reverse into the front of your car while it's parked. This car dash cam comes with 12 months warranty, brought to you by the leader in electronic devices as well as wholesale car video and DVR kits..